A healthy spin on the traditional Avgolemono, which has rice in it. Add onion, garlic, celery and carrot to mixer bowl, chop for 3 sec/speed 9/MC on. Add butter and sauté for 5 min/100°C or 212°F/speed 1/MC off. Add water, salt, pepper and bay leaf to mixer bowl, put chicken into steaming tray and steam for 60 min/steaming temperature/speed 2. Top up with water and steam for a further 20 min/steaming temperature/speed 2. Remove chicken from steaming tray and when cooled enough to handle, roughly remove the meat. Keep warm, covered, in a thermal pot. With a fork, whisk together lemon juice and egg yolk in a measuring jug. Take 1 cup of stock from the mixer bowl and slowly whisk it into the lemon juice and yolk mixture with a fork. Blend stock for 20 sec/speed 9/MC on increasing speed gradually. Set timer for 1 min/speed 3, and slowly drizzle in egg and lemon juice mixture. Pour soup over chicken and serve with fresh chopped parsley. Its really important to slowly whisk in the hot stock with the yolk, so as to not scramble it. At step 1 you may need to increase the chopping time slightly. At step 2 cook for a couple of extra minutes if necessary. At step 3 you will need to use speed 3 and if you're using an Intelli, make sure you put a tea towel over the lid of the steamer. At step 4 cook longer if required. This was really nice but not sure it was worth 1.5 hours. I might use thigh/breast next time to cut down on the steaming time. When the directions say “top up with water”, it would be good to know how much to top up? I made this last week and it was delicious. I was just wondering the lemon and garlic that I used to stuff the chicken , do I throw them out? Or add to the soup? Thanks! Delicious!! I added 4 whole eggs instead of just the yolks (didn’t want the leftover whites) and it turned out beautifully! Also added some pasta to the broth and cooked it in there before adding the egg mix to bulk it out. Can you freeze the soup? I made a variation with seafood marinara mix – I made the stock and cooked for 30mins and then put the seafood mix (600g) in the Varoma and steamed for 7 minutes, and then served as per recipe. So tasty!!! Thanks for a great recipe Nikalene. I’ve made this twice now. The first time with the juice of one whole lemon and the second time with the juice from half a lemon. I love all things lemon so I didn’t have a problem but miss 13 isn’t a fan (though she finished her portion). I love how effortless it is to make this soup. Best of all, I have leftover chicken for salad/sandwiches the next day. Thanks Nikalene. Some of my family members who don’t enjoy non-sweet flavours found it hard to eat. Loved this although cut down a bit on the lemon juice second time I made it. Just LOVE this soup! Reminds me of my childhood and I am not missing the rice that is in the traditional avgolemono soup. I like to keep a supply in the fridge and heat it up and drink it (minus chocken) like bone broth. Can I make this with already cooked chicken? I have a BBQ chicken id like to use up! Wow this was delicious! was feeling horrible and fluey and came home and made this. I found it easy as i used chicken thigh in the varoma for 25 mins and then the rest. I also added zucchini into the vege stock part at the start and it is just delicious. Will definitely make again! loved this recipe, I only had a pre cooked chicken so had to slightly revamp the instructions but all worked well, I love the diversity of all your recipients…..ps keep them coming. Husband loved it as it was so close to what he grew up with. He also didn’t mind the omission of rice. Very tasty! OMG this is just awesome . So delicious . My fussy hubby loved it and it bought back so many memories of my childhood . Best friend mum was Greek and she instilled in me my love of lemons . I remember always thinking all the dishes she made with lemon were so fresh and tasty !!!!! Thank you so much for making me an incredible cook !!!! Will be on the menu each week I think !!! Enjoyed and was nice-not a recipe that we will have often though. This soup was just so delicious. I was not convinced that I was going to like it but I loved it. Such a delicate flavour, will definitely be making it again. Thanks Nikalene. 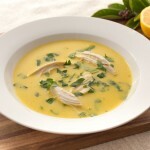 I love the lemony soup, other half liked it … 7 yr old fuss pot just ate the chicken … More for me ! Yummy. Lunches sorted this week with leftovers of this for me and cauliflower soup I made earlier. It takes time to make this but yum and easy with simple ingredients. 🙂 2 out of 3 isn’t bad in this house … Pre thermo at times l has been known to make 3 different meals 🙁 not anymore ! This was absolutely delicious! I didn’t have a whole chicken so put ~500g of thighs in the basket for 30 min and they came out perfect. Will definitely be making again.